Quality assurance of any software is a very important aspect in the process of construction and development of software. The better the quality of it, will avoid process failures that may become critical to business. 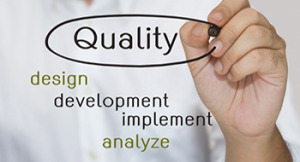 Quality assurance is based on structured and recognized worldwide techniques. The sets of tests performed for each software, are designed and analyzed in detail to achieve covering all critical aspects within each process. So then, Foloware within their processes, specializes in Quality Assurance, providing complete satisfaction in the products delivery, which results in reliability and customer loyalty of our customers. Also, Foloware is able to provide a quality assurance specialized team to support companies requiring this service in their quality assurance processes.